The research partners of the DISC consortium are planning to work in a continuous interaction for the whole duration of the project in order to identify high potential cells which might bring significant knowledge advancement for the heterojunction cells for carrier selective junction (CSJ), transparent conductive oxide (TCO) and metallization subjects. The most promising architectures will be firstly analysed, which will allow a transfer on the prototype level (WP4) at M18 (Route 1). Research work will then continue with the other promising options, following a stage gate model with "go"-"no go" decisions (see figure above) based on the preselected criteria. Route 2 will have two selection gates (M24 and M30) which have as purpose to select every 6 months the most promising PV cells. In this way we make sure that research effort is focused on meeting the overall project objectives. 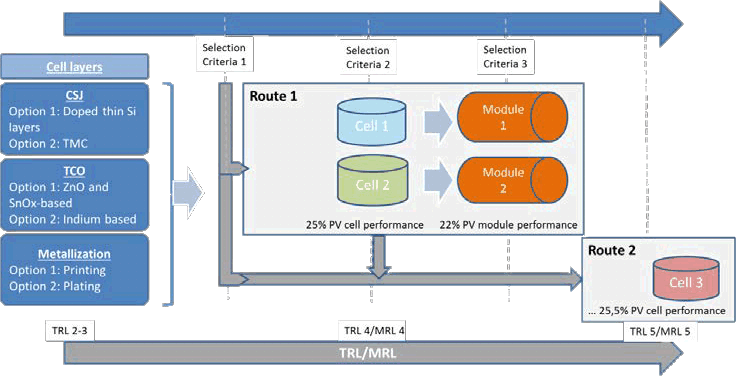 By following this innovation process, 3 cell types (2 cells with expected 25% performance at M24 and one cell with expected 25,5% performance at M30) and two module types (22% performance at M30) will be transferred to WP4 for prototype (TRL 5).